Know more about plan upgrades, downgrades and cancellations. You can manage your billing, plans and subscription by going to Profile > Account Settings > Billing. Clock provides a 14 day trial on all plans. By default you will be subscribed to the 10 user plan. If you do not add your credit card for billing, your account will automatically be cancelled after the 14 day trial. If you would like to add more than 10 users during the trial, you can update your credit card details and move to the next higher plan that suits your need. NOTE: ClockIt will not bill your card when you are in trial. 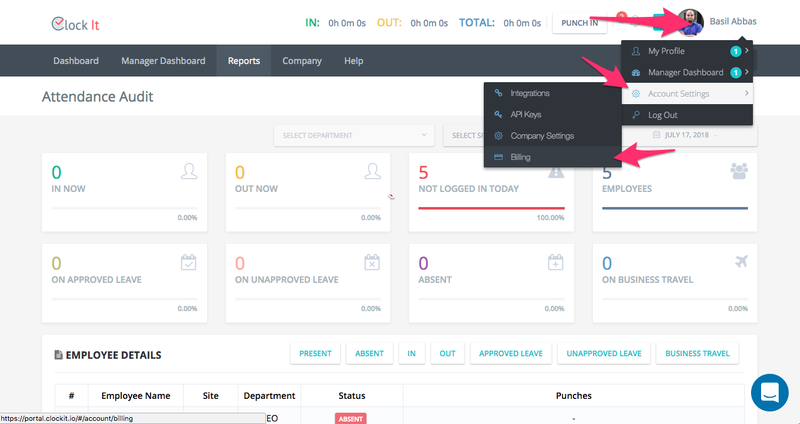 For Example, if you are in trial and move to the 100 user account, your will not be billed until your trial days are over. To update your card information, fill out your card details and hit Add Card. Once your card is added your plan becomes active. You will not be billed anything until your trial is over. If your trial is already exhausted you will be billed immediately and your plan becomes active. All payment information is stored with our payment gateway provider Stripe. ClockIt does not store any card information on our servers. 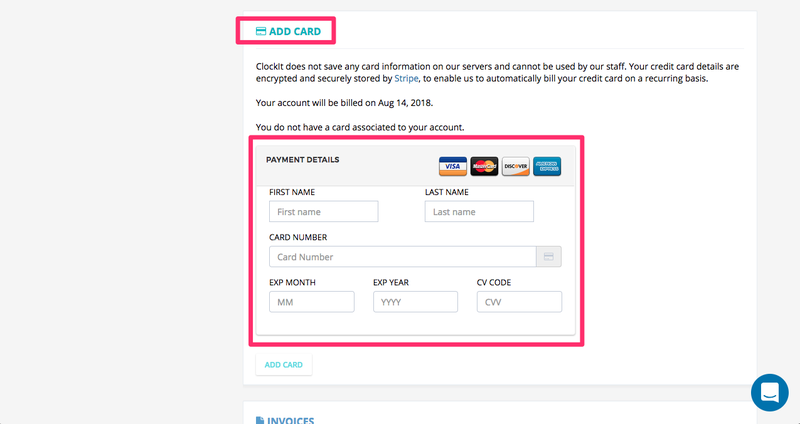 Neither ClockIt not it's team members can access your card information once saved. If you would like to upgrade your plan, select the appropriate plan from the dropdown and save your changes. All charges in ClockIt are prorated and billed by the minute. 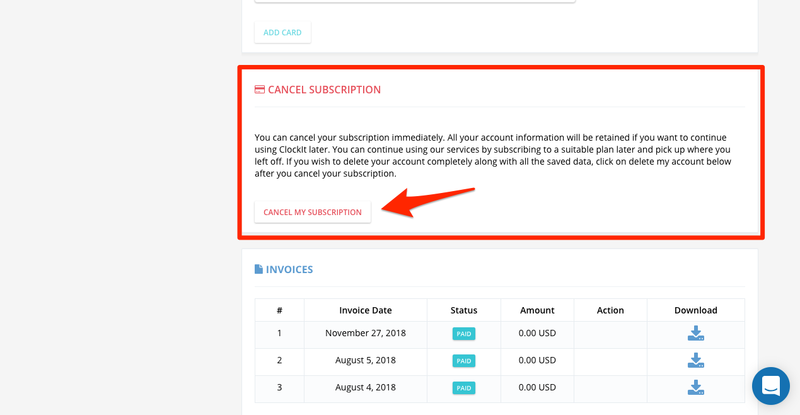 To cancel you plan and subscription click on CANCEL MY SUBSCRIPTION. You will not be billed moving forward and your card details will be deleted from your account. You can reactivate your subscription at anytime by selecting a suitable plan later. If you wish to completely delete your account and all stored data click on delete my account after you cancel your subscription. 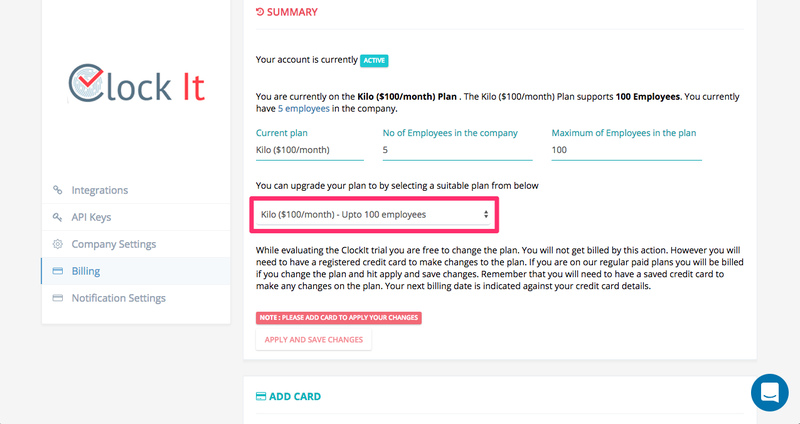 If you have a special plan and cannot see the cancel button you can cancel your account by writing to us at hello@clockit.io or even message us on the chat from the bottom right. Our support team will ensure that your account is deactivated. 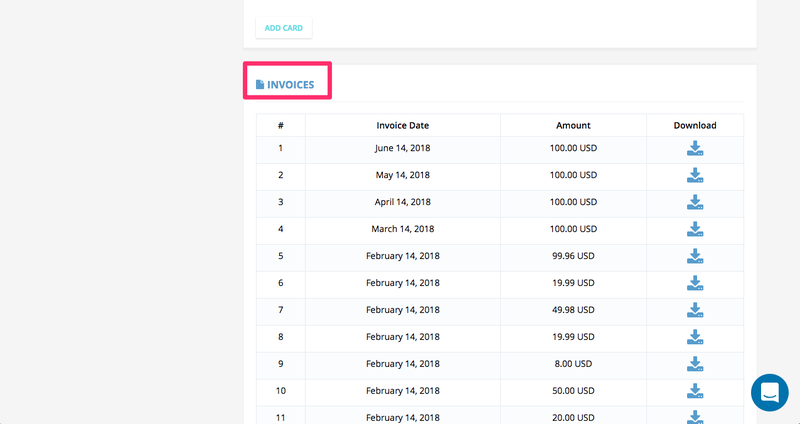 All your invoices can be obtained from the billing page under the invoices section at the bottom.